Now, I know what you may be thinking. Oahu? We’ve done Oahu! Besides, Waikiki is too touristy. Ah, but you’ve never done Oahu Ko Olina-style. That’s because Ko Olina is located on the leeward, or west, side of the island, the complete opposite side of Waikiki. And not only is Ko Olina about an hour away from Waikiki, it feels like a world away when you’re there. Now if you’re worried that you’ll be far away from the food, drink and fun at Waikiki — don’t. Ko Olina is 642 acres of varied attractions and amenities (the same size as Waikiki, but with one-third the density). On one end you have the luxurious Four Seasons and the (grownup-friendly) Disney-themed Aulani, with all its attendant restaurants, spas, even a water park. At the other end, Hawaii’s only luxury marina. (They shot the Pirates of the Carribbean movies nearby, and when I was there, you could see the Black Pearl pirate ship they built for the film.) Housing 344 wet slips with watercraft ranging from 30-footers to 240-foot luxury yachts, the Ko Olina Marina accommodates an international clientele from British to Japanese to mainland American. Sign up for all manner of water sports at the Marina Shop — everything from helicopter tours to deep sea fishing to swimming with dolphins. Esconced in between is the luxurious Ko Olina Beach Villas Resort, complete with Roy Yamaguchi-designed gourmet kitchens and special touches like the floating lily pad lounge chaises in the pool. With two to three bedrooms going for half a mill and up, you can expect a lot of amenities like pocketed sliding glass doors that open fully to the lanai and lei-making classes with a former Miss Hawaii. If your taste runs a little more family-friendly, there’s always the tropical water park-like Marriott’s Ko Olina Beach Club timeshares, with a relatively hopping bar area, a pitch black water tube slide, and plenty of kids running around. One of four manmade beach coves — calm, safe, and kid-friendly. All this is connected by four idyllic beach coves, sheltered from the ocean and perfect for kids or wiling the day away. A pleasant oceanfront path connects all the properties and the lagoons, so getting from hotel to lagoon to restaurant is not a problem. Of course, there are plenty of restaurants, from the island’s only other Roy’s at the 18-hole championship Ko Olina Golf Club to a whole range of restaurants at Aulani. There’s even the Ko Olina Station with Mexican fast food, ice cream and other retail outlets. The natural “sacred” lagoon abutting Lanikuhonua, once thought to be where Queen Ka’ahumanu, the favorite wife of Kamehameha I, bathed. But by far my favorite part of Ko Olina is the natural lagoon nestled against Lanikuhonua, the private estate of the Campbell Estate Family Trust. (James Campbell settled in Hawaii in the 1800s). 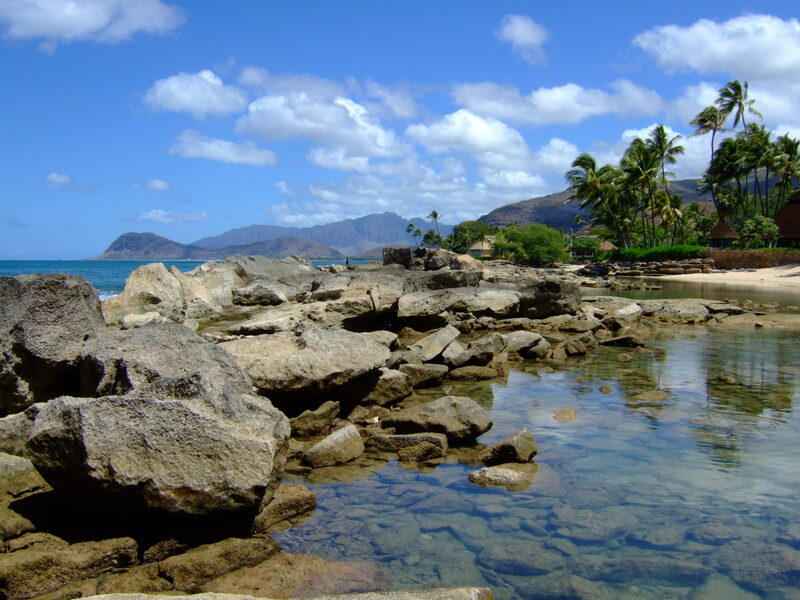 The “sacred pools,” where it is said that Queen Ka’ahumanu once bathed, served as the original inspiration for the four other manmade lagoons of Ko Olina. Indeed, it’s what people think Old Hawaii would look like, says Mike Nelson, then-executive vice president of the resort. And it is heavenly. Go early in the day, when the tide is low and the waves less boisterous. Hop from boulder to boulder, scouring the glass-like tide pools along the way for curious black jumping crabs or yellow and black striped fish. 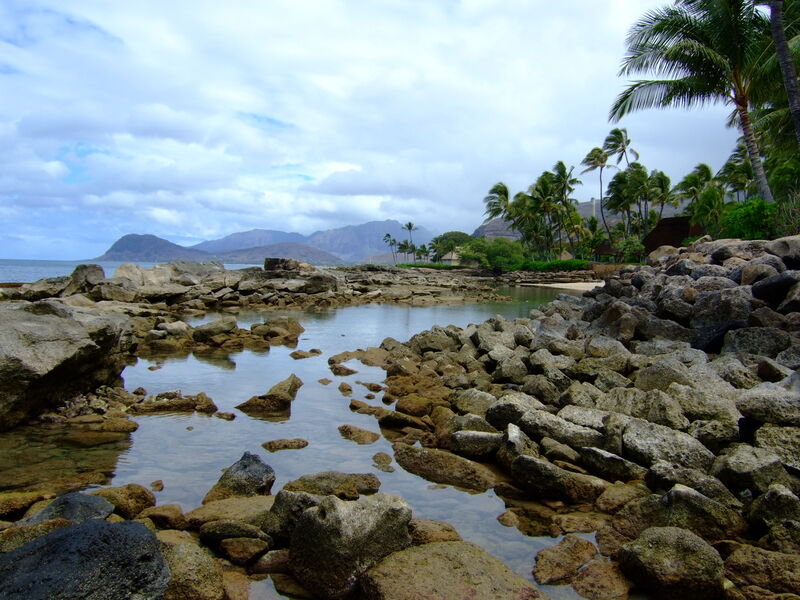 Take in the stunning view of the Waianae mountain range. Relax in the shade on one of the flatter boulders, the soothing melody of traditional Hawaiian songs drifting from Lanikuhonua (Auntie Nettie teaches folk music there to locals on occasion), the thunder of crashing waves safely set back 100 feet or so by the intimidating boulder wall. Most likely, your only companion will be tiny crabs, skittering from crevice to crevice. If you’re lucky, you may be able to get a glimpse of the private grounds of Lanikuhonua. Auntie Nettie is the official caretaker of the land and is a “kahu,” or spiritual advisor, a title she inherited from her mother, the original kahu. (She goes to every groundbreaking at Ko Olina, including the most recent one for the Aulani, the first Disney resort outside of its theme parks.) The hit TV show Lost shot many a scene on the sacred property, which is dedicated to preserving, displaying and promoting the cultural traditions of Hawaii. Legends and history abound on the grounds, as evidenced by the smattering of sacred boulders and rocks carried in from other parts of the island. 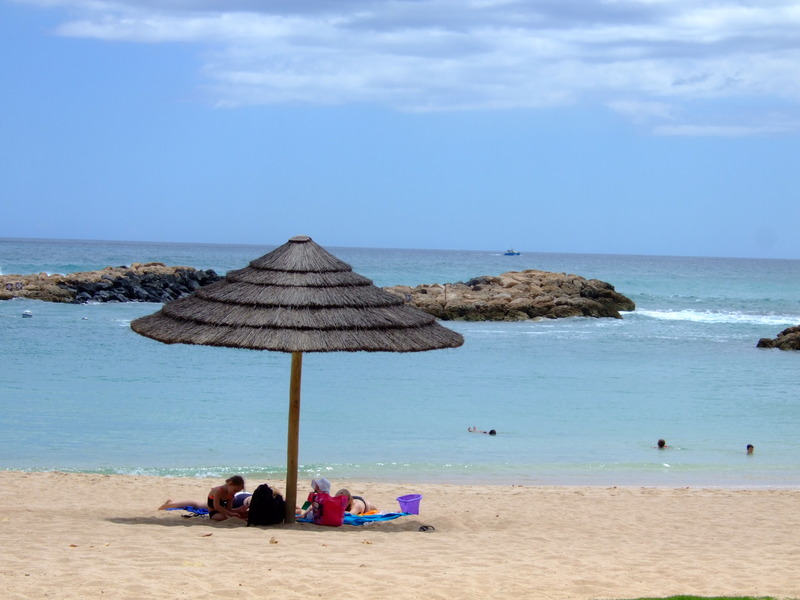 One thing you have to do before you leave is take advantage of Ko Olina’s location on the leeward side of the island. After all, unlike Waikiki, this side of the island gets one helluva sunset every evening.